Don’t make Israel a “Bucket List” trip, make it a “now” trip. November 2017 was my first trip to Israel. It changed my life forever. My only regret was not going when I was in my 20’s. There is so much you will bring back in your heart, soul & spirit that America needs. I could have made it a priority, but it wasn’t. London, England happened, as well as, Mexico multiple times, the Caribbean several, a few cruises and added many states were added to our “passport…..,” but the one I should have MADE happen was procrastinated. We left home the 16th to have “another first” trip for four days in the Big Apple (more about that later). The morning of the 20th we packed up. We shipped extra coats and NYC souvenirs back home, then met up with the group we would be traveling to and with in Israel. Audios NYC, NY – Hello Holy Land! Pillars of ruins of palace on the Mediterranean in Caesarea, Israel. Some we are traveling with to Israel. “dive” into a history lesson was at the port in Jaffa, where Jonah boarded the ship to Nineveh. We hit the hay in Tel Aviv for the night. The next morning we headed north along the Mediterranean to Caesarea. We took in the ruins of one of Herod the Great’s palaces, where Pontius Pilate liked to summer. The hyper-dome, theater and aqua duct were all close. We hopped back on the bus and headed North. Several stops at other sites were made before unpacking for a few days Tiberius. Caesarea Philippi – Banias, IL It sits at the base of Mt. Hermon in the Golan Heights. 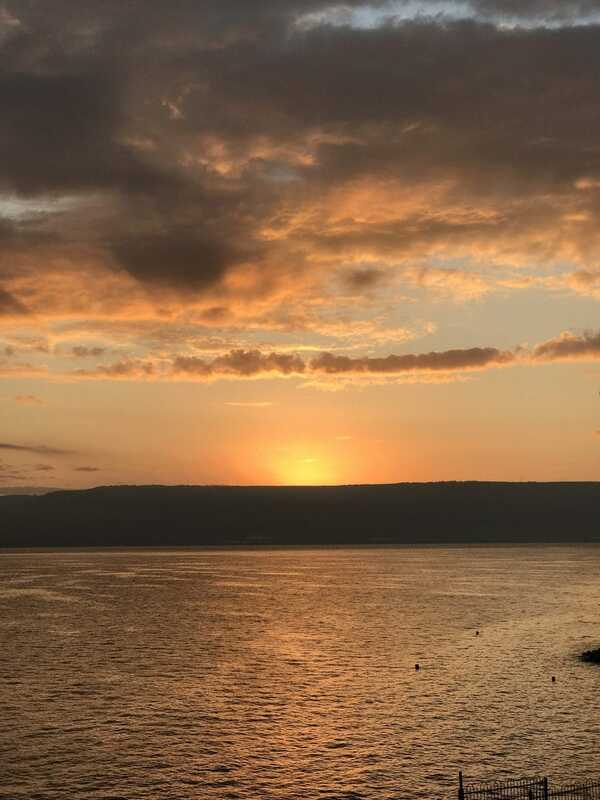 Sunrise on the Sea of Galilee – Shades of yellow. orange, lavender and peach. It doubles it’s splendor by reflecting on the water and shading the clouds above. Our hotel where we stayed was on the Sea of Galilee. Great balcony, terrific sunrises – don’t think I missed a one. Took about 2 days to get a sleeping rhythm. For three days we journeyed all over the northern Galilee region. I’ll let the pictures / video tell the stories. US Embassy in Tel Aviv November 2017 The week before it was announced that it would be moved to Jerusalem. Next part of our trip took us to the NOW capital of Israel – Jerusalem. There was so much to see and do. When we were done spending our days there, we traveled to the furthest point South – Eilate. It is a “resort” area that rests on the banks of the Red Sea. We were able to stand there in Israel and see Jordan, Saudi Arabia, and Egypt. Our last night in Israel was spent there. We left Eilate and traveled through the Negev desert and arrived that evening in Tel Aviv to have our farewell dinner at the hotel, where we freshened up before being dropped off at the airport around 9:00 pm. View from Mt. of Beatitudes – Beautiful bougainvillea, lantana and palms – with a dove in flight. Sea of Galilee in the distance. Emotional & exhausted, I knew as I left I would be back to God’s land (I just never knew how soon it would be). We boarded our plane at 12:30 am. Emotional & exhausted, I knew as I left I would be back to God’s land (I just never knew how soon it would be). We arrived in NYC, NY about 6:00 am on December 1, 2017. We caught a ride to LaGuardia to catch the next plane home, which was wwwaaayyyyy to long a layover when you’ve been up like 24 hrs. Finally arrived in Little Rock, AR, then home by midnight. Think I slept for the better part of the next 48 hours. Israel – Top of my list of where I would go back…. Little did I know that I would be back in just a short 6 months. When I found an amazing deal on airline, rooms and a rental car in April 2018, it took me no time to decide I would return. I went for 14 days: SOLO, traveled on God’s time clock and map. Some the places our group had went I returned to, but also I ventured to new sights and towns. The Lord laid so much on my heart about why we, the western world / church / Christians, should come to Israel. He wants us to love the Jews and Israel; to understand His covenant and see just why and how much He loves this land. The Bible will come to life for you!!! So glad you’ll have that memory forever! This looks amazing, great pictures and you make me want to go. Unfortunately, I am out of vacation time until next year. Just reading your post my heart was telling me I need to see this! Thanks for the info! What an amazing trip! I would love to go Isreal one day, but it really wasn’t on my bucket list. I am going to add this to the top of my list thanks to this post. We still have about 5 seats available 😉. I am always in awe when I read about your trip to Israel. I want to make a trip to Israel so very badly. Your pictures are amazing and you can just see the light in your eyes. Thank you! I hope you make it happen sooner rather than later. It will affect how you raise your children once you’ve been there, because it changes how you think about everything. Or it changed us that much. Noah and I are headed over there Sept. 1 and won’t be back till the 26th! We are SO EXCITED!!! Wow! I love the passion in your writing and you can feel how passionate you are about Israel. Beautiful pictures only added more reasons for someone to book a trip to visit Israel. Thank you for the kind words. I am so glad that come through in my writing to others, because that’s what He does for your heart after going there.